What is the status of the human gene pool? The new iPhone is released today! Get yours today, before you are labeled an “uncool looser”! OK, I do not have an iPhone nor do I care to own one. I have seen and played with them. They look and feel cool but they are not the most productive device. Blackberry owns that title. This morning I went to breakfast with a colleague and drove by an AT&T store. 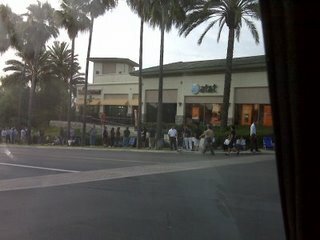 I could not believe the line out in front of the store. By the time we left breakfast, the line was even longer. 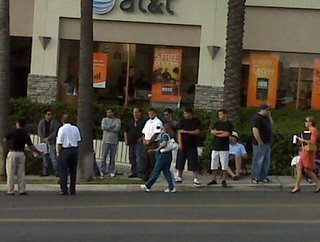 These people are taking a day off of work, or whatever they do with their lives, to purchase a mobile phone. I tell you, something is seriously wrong with these people. I do not get the “iPhone” phenomenon. Do only the “creative” people get the iPhone and the Mac in general (I am not looking for a Mac Vs. PC flame war here)? Ahh, I wish them the best. Enjoy your new phone.